With excellent optical clarity this Kahles K624i offers long range shooters a masterpiece of a scope. This scope has been derived of over 118 years of experience. It offers 95% light transmission, ultra-precision adjustments and it is constructed of hardened steel machined to the most demanding tolerances. 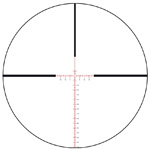 This scope will provide you the ability to see, take aim and shoot your target within minuscule margins of error.